Fabrique Nationale Herstal (English: National Factory Herstal), self-identified as FN Herstal and often referred to as Fabrique Nationale or simply FN, is a leading firearms manufacturer located in Herstal, Belgium, owned by the holding company Herstal Group which is in turn owned by the regional government of Wallonia. It is currently the largest exporter of military small arms in Europe. Herstal Group also owns U.S. Repeating Arms Company (Winchester) and Browning Arms Company. FN America is the American subsidiary of FN Herstal; FN America was formed by the merger of FN's previous two American subsidiaries: FN Manufacturing and FNH USA. FN Manufacturing, located in Columbia, South Carolina, was the manufacturing branch of FN Herstal in the United States, producing firearms such as the M249 and M240 machine guns and the M16 rifle, among others. FNH USA, located in McLean, Virginia, was the sales and marketing branch of FN Herstal in the United States. After the merger, the facilities in South Carolina and Virginia remained, but with integrated management. A United Kingdom based manufacturing facility FNH UK is now also in operation. Firearms designed and/or manufactured by FN include the Browning Hi-Power and Five-seven pistols, the FAL, FNC, F2000 and SCAR rifles, the P90 submachine gun, the M2 Browning, MAG and Minimi machine guns: all have been commercially successful. FN Herstal's firearms are used by the militaries of over 100 countries. FN Herstal originated in the small city of Herstal, near Liège. The Fabrique Nationale d'Armes de Guerre (French for National Factory of Weapons of War) was established in 1889 to manufacture 150,000 Mauser Model 89 rifles ordered by the Belgian Government. FN was co-founded by the major arms makers of the Liège region, with Henri Pieper of Anciens Etablissements Pieper being the driving force and the primary shareholder of the new company. In 1897 the company entered into a long-lasting relationship with John Moses Browning, a well-known firearms designer. FN was an important manufacturer of motor vehicles in Belgium, a development championed by Alexandre Galopin as managing director. Cars were produced in Herstal in the early 1900s until 1935. Production of FN motorcycles continued until 1965, and production of trucks until 1970. In 1973, FN changed its name to reflect a product line diversified far beyond just "weapons of war", adopting the current name of Fabrique Nationale d'Herstal. One of Fabrique Nationale's handguns, a Model 1910 semi-automatic pistol in 9×17mm (.380 ACP) (serial number 19074) was one of four weapons that were taken from the assassins of Archduke Franz Ferdinand of Austria, although it is unknown which of the four weapons fired the fatal round. John Moses Browning began development of the Browning GP35 'High Power' (sometimes written as Hi-Power) pistol, the GP standing for Grande Puissance or "high power" in French. However, the weapon was finalized by Dieudonné Saive and did not appear until nearly a decade after Browning's death. The FN Manufacturing LLC plant in Columbia, South Carolina is part of the military division of FN. It is primarily responsible for the production of U.S. military weapons, such as M16 rifles, M249 light machine guns, M240 machine guns, and M2 machine guns. Barracuda: Double-action multi-caliber revolver that can be switched between three calibers (9×19mm Parabellum, .38 Special and .357 Magnum) by changing parts of the cylinder. FN 509: Redesigned version of the FNS Compact pistol in 9×19mm Parabellum. FN Five-seveN: Lightweight polymer-framed pistol with a 20-round magazine capacity, and designed to use FN's 5.7×28mm cartridge. In service with military and police forces in over 40 nations throughout the world. FN FNP: Series of polymer-framed pistols offered in 9×19mm Parabellum, .357 SIG, .40 S&W, and .45 ACP. FN FNX: Updated and reengineered version of the FNP series pistol in 9×19mm Parabellum, .40 S&W and .45 ACP. FN FNS: Polymer striker-fired pistols in 9×19mm Parabellum and 40 S&W. FN Forty-Nine: Pistol chambered for 9×19mm Parabellum and .40 S&W. FN Browning Hi-Power: Single-action pistol chambered for 9×19mm Parabellum and .40 S&W. One of the most widely used military pistols of all time, having been used by the armed forces of over 50 nations. HP-DA: 9×19mm Parabellum pistol, double-action variant of the Browning Hi-Power. FN M1900: .32 ACP blowback semi-automatic pistol. FN Model 1903: Blowback semi-automatic pistol chambered for .32 ACP and 9×20mm Long Browning. FN M1905: .25 ACP vest pocket blowback semi-automatic pistol. FN Model 1910: Single-action pistol chambered for .32 ACP and .380 ACP. FN Model 1922: Similar to the FN 1910 but with a longer barrel. FN P90: Ambidextrous bullpup personal defense weapon with a top-mounted 50-round magazine and chambered for FN's 5.7×28mm cartridge. In service with military and police forces in over 40 countries. Uzi: Built under licence from Israel Military Industries. Browning 22 Semi-Auto rifle .22 LR, .22 Short. Takedown rifle. Production began in 1914 and continued through 1974 in Belgium. FN CAL: Carabine Automatique Légère, 5.56×45mm NATO assault rifle. FN F2000: 5.56×45mm NATO bullpup assault rifle, part of a system with a computerized sight and 40mm grenade launcher or 12 gauge shotgun. FN FS2000: Semi-automatic sporting version of the F2000 rifle. FN FAL: Fusil Automatique Léger, 7.62×51mm NATO battle rifle. One of the most widely used rifles in history, having been used by over 90 nations. FN FNAR: Semi-automatic rifle chambered in 7.62×51mm NATO. FN FNC: Fabrique Nationale Carabine, 5.56×45mm NATO assault rifle. M16: 5.56×45mm NATO rifle (produced under licence by Colt Defense via a U.S. Government contract since 1991, by FNH USA). M4A1: 5.56×45mm NATO rifle (produced under contract from the U.S. Government since 2013 by FNH USA). Mle 1930: Belgian variant of the Browning M1918, chambered in 7.65×53mm Belgian Mauser. FN Model 1949: Semi-automatic rifle / selective fire automatic rifle chambered in .30-06 Springfield, 7.92×57mm Mauser, 7.62×51mm NATO, and 7×57mm Mauser. PS90: Semi-automatic sporting carbine version of the P90 submachine gun. FN SCAR: SOF Combat Assault Rifle, modular assault/battle rifle system with dedicated versions in 5.56×45mm NATO and 7.62×51mm NATO. Model 1924 / Model 1930: Carbine and rifle based on the Mauser 98 carbine. Karabiner 98k: 7.92×57mm Mauser bolt-action rifle produced post-World War II. Model 1950: .30-06 Springfield bolt-action rifle; updated version of the Model 1930. FN Model 30-11: 7.62×51mm NATO bolt-action sniper rifle developed from FN-built Mauser Karabiner 98k rifles. FN Ballista: Modular .338 Lapua Magnum long range sniper rifle that is convertible to .308 Winchester or .300 Winchester Magnum calibers. PBR: Patrol Bolt Rifle; 7.62×51mm NATO bolt-action rifle intended for police patrol cruisers. FN Special Police Rifle: Special Police Rifle; bolt-action sniper rifle based on the Winchester Model 70, chambered in 7.62×51mm NATO and .300 Winchester Magnum, intended for FBI and SWAT teams. FN Tactical Sport Rifle: Tactical Sports Rifle based on the SPR. FN BRG-15: Experimental heavy machine gun chambered in 15.5×115mm. M2 Browning: .50 BMG (12.7×99mm NATO) heavy machine gun produced under licence. FN MAG: Mitrailleuse A Gaz, 7.62×51mm NATO general-purpose machine gun. Used by more than 80 nations, and made under licence in countries such as Argentina, Egypt, India, Singapore, the United Kingdom and the United States. FN Minimi: Mini Mitrailleuse, 5.56×45mm NATO light machine gun. 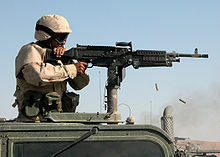 In service in over 75 nations and used in the United States as the M249 SAW. Mk 48 machine gun: Variant of the M249 light machine gun. Chambered in 7.62×51mm NATO, and developed to meet a United States special forces requirement. FN BAR Model 1930 BAR: Licence-built version of the M1918 BAR, rechambered for the 7.92×57mm Mauser cartridge. M3 (FN M3M/GAU-21 and FN M3P): A belt-fed heavy machine gun which is a modernized form of the M2 Browning .50 caliber heavy machine gun. It is intended for vehicle, watercraft and aircraft mounting. FN P-12: 12-gauge pump-action shotgun with 18-inch barrel and 5-round capacity. FN SLP (Self-Loading Police): 12-gauge gas-operated semi-automatic shotgun offered in four different models with various barrel lengths, sight options, and capacities. Introduced in 2008, and named "2009 Shotgun of the Year" by American Rifleman magazine. FN TPS (Tactical Police Shotgun): 12-gauge pump-action shotgun with 5 or 8-round capacity. It is an upgraded version of the Winchester Repeating Arms Company Winchester 1300. Browning Auto-5 recoil-operated semi-automatic shotgun with 5-round capacity, designed by John Browning. Mitrailleuse d´Avion Browning - F.N. Calibre 13,2 mm: Heavy airplane machine gun. It was an improved M2 Browning for use in aircraft during WWII. The weapon had increased firerate and fired a more powerful 13.2x99 Hotchkiss cartridge. FN also invented a high velocity high explosive variant of the cartridge just for this weapon. FN HMP250: Heavy Machine Gun Pod. It is a system featuring a .50 cal FN M3P machine gun, a 275-round ammunition box, and a links and cases collector. FN HMP400: Heavy Machine Gun Pod. It is a system featuring a .50 cal FN M3P machine gun, a 400-round ammunition box capacity, and a links or links and cases collector. FN RMP: Rocket Machine Gun Pod. It is system comprising a 12.7mm (.50 caliber) FN M3P machine gun, a NATO Standard 2.75inch/70mm 3-tube rocket launcher and a 400-round machine gun ammunition box. 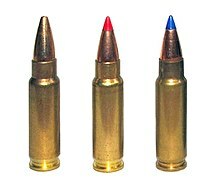 5.56×45mm SS109: NATO standard 5.56×45mm cartridge. FN 5.7×28mm: Small-caliber, high-velocity cartridge designed for use with the FN P90 PDW and FN Five-seven pistol. EGLM: 40mm Ergonomic Grenade Launcher Module designed for the FN SCAR. FN 303: Less-lethal 17 mm multi-shot projectile launcher. FN 303 P: Pistol version of the less-lethal FN 303 launcher. FN Telgren telescoping shoot-through rifle-grenade. ^ a b c d e f g "Herstal Group: About Us". FN Herstal. Retrieved 2010-06-24. ^ "Les armes belges, un business juteux" (in French). La Dernière Heure (DHnet). December 31, 2012. Retrieved November 1, 2013. ^ a b c d "FN Manufacturing and FNH USA to consolidate U.S. Operations". FN Herstal. June 6, 2014. Retrieved May 15, 2017. ^ Francotte, Auguste; Gaier, Claude; Karlshausen, Robert (2008). Ars Mechanica. Herstal Group. ISBN 978-2-87415-877-3. ^ Stevens, R. Blake The Browning High Power Automatic Pistol. Collector Grade Publications (1990). ISBN 978-0-88935-089-2. ^ a b Tirans, Ivars (2009). "Baltic Defence Research and Technology 2009 Conference Proceedings". Military Review: Scientific Journal for Security and Defence (ISSN 1407-1746), Nr. 3/4 (132/133), p 103. ^ Arnold, David W. "Classic Handguns of the 20th Century: The Browning HI-Power". Handguns Magazine. Archived from the original on 2010-01-07. Retrieved 2010-01-19. ^ "FN 15® Series - FN®". ^ "Army Awards New M4/M4A1 Contract to FN - Kit Up!". 23 February 2013. ^ a b "FN Manufacturing, LLC: Products - MK48 MOD 1". FN Manufacturing, LLC. 2010. Archived from the original on December 4, 2010. Retrieved December 5, 2010. ^ "Fabrique Nationale FN M3P Belt-Fed Vehicle Heavy Machine Gun (HMG)". militaryfactory.com. 18 January 2014. ^ "FNH USA Shotguns - SLP". FNH USA. 2012. Archived from the original on September 5, 2012. Retrieved September 7, 2012. ^ "FNH USA Ammunition - 5.7x28mm". FNH USA. 2013. Archived from the original on November 4, 2013. Retrieved October 25, 2013. ^ "FNH USA Less Lethal Products - FN 303 System". FNH USA. 2013. Archived from the original on October 29, 2013. Retrieved October 25, 2013. ^ "FNH USA Less Lethal Products - FN 303 P Series". FNH USA. 2013. Archived from the original on October 29, 2013. Retrieved October 25, 2013. Wikimedia Commons has media related to Fabrique Nationale de Herstal. This page was last edited on 15 February 2019, at 20:52 (UTC).